David, Will and I (this is Andrew) are good for each other. We’re the kind of friends that sit around and text each other at night about weather data. At 7:39 pm, David said “Feels like it’s gonna fog.” We continued by exchanging weather data numbers that would appear, to some, to be some kind of lock combination. It was a blast. Sure enough, on I-24, on my way home from a Christmas party we noticed Mill Creek starting to get a bit foggy at the bridge. We all knew what this meant. With temps expected to be in the low 20s, freezing fog was on its way. This occurs when fog clings to surfaces that are below freezing, including elevated road surfaces, and becomes an issue for drivers. NWS also saw it and issued a freezing fog advisory, which expired at 9:00 am this morning. But, it was cold. NWS pointed out that Brentwood dropped to 15° and BNA (the airport) dropped to 20°. Let’s just forget that happened and move on. Now that the sun is out temps will rapidly climb to near 50° with plenty of sun. Seems like it’s been a while since we’ve had to count that high! If you follow weather somewhat closely, you probably know warm-ups generally occur before a precip-making system moves in. This would be correct. Clouds move in tonight ahead of our next weather maker, but we’ll stay dry, and temps should bottom out at or around 32°. Our warm-up continues on Wednesday with a forecast high of 54°. There will probably be more clouds than sun, and those clouds could even squeeze out a sprinkle of rain, but promise me you won’t cancel any plans over that chance. Y’all….54°. 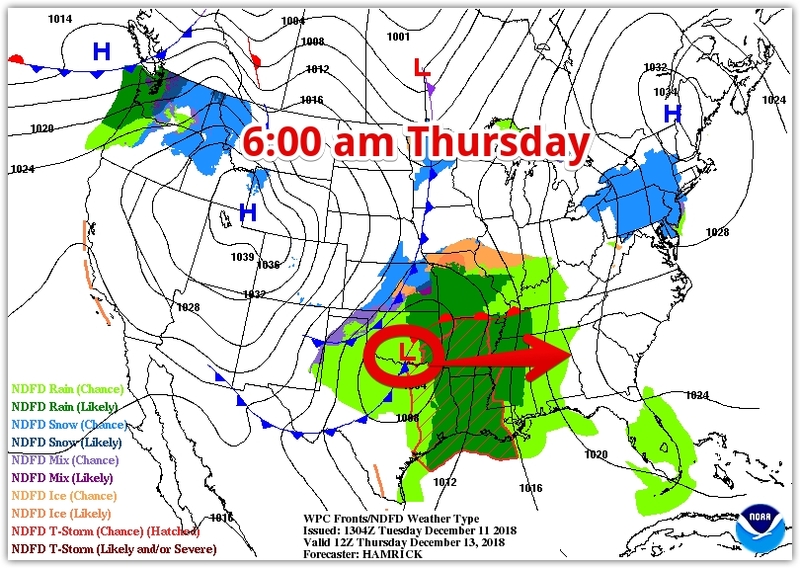 A low pressure system will be developing in Texas and Oklahoma around the middle of the week that will spread rain and maybe a few thunderstorms over the southeast during this period. The track of this low pressure center will be S of us, which will keep low severe weather chances across the Gulf Coast states and leave us out. …light rain expected to spread eastward into our western counties after midnight into the day on Thursday. As the upper low inches eastward and deeper moisture enters the forecast area, more widespread rain is anticipated by Thursday night and Friday. Cannot even rule out a thunderstorm or two during this period… The upper low is forecast by the 00Z ECMWF and GFS [two models] to pass just south of the Mid State from Friday night into Saturday, with off and on light rain continuing throughout the CWA [our area] before finally ending Saturday night. 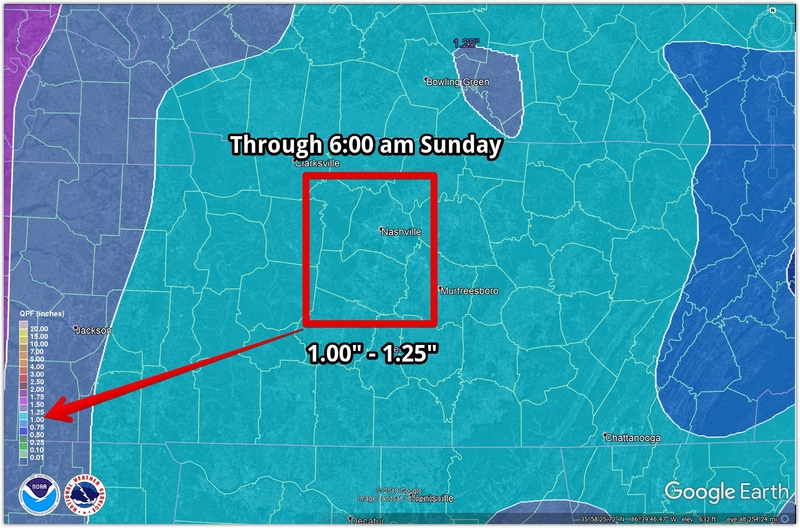 Through 6:00 am Sunday morning, WPC projects we’ll see between an inch to an inch and a quarter of rainfall. Severe Weather: No. As mentioned above, the low will pass S of us. Good news. Winter Weather: No. Cold air will stay trapped up north. Flooding: No. An inch of rain spread out over that long of a period won’t be a problem.